Huawei has always been particularly persistent in pushing its home-brewed HiSilicon Kirin chips, perhaps even to the point of stubbornness. It is hardly a secret that the chipset family in question has a tendency of underperforming and has often been plagued by poor optimization and coupling with low-end GPUs. For Huawei's sake, we sincerely hope that the highly-praised Kirin 950 will finally put an end to this unfavorable trend, but currently it seems like a good idea to steer away from Kirin if performance is what you are after. However, the OEM does make exceptions in its SoC choices from time to time especially when it comes to mid-range solutions. The Huawei G8 is a perfect example. Just like the P8lite, it utilized a Qualcomm Snapdragon 615 chipset - a pretty wide-spread mid-range platform. It is hardly a power-house, but has proven its worth more than once in a long line of excellent handsets. This made it a lot easier for us to pick a selection of hardware-rivals to the G8. Even when throwing in the extra requirements for a 5.5-inch Full HD display and 2GB or 3GB of RAM, the list still remains long with devices like the Oppo R7s, which we just recently reviewed, the HTC Desire 826, Samsung Galaxy A7 and Motorola Moto X Play. As it so happens, the latter two also fall into the price range of the Huawei G8, which currently retails for around 350€ to 400€. We also made sure to explore other viable options at that price point and, it turns out, there are just as abundant. You can easily pick up a flagship device form last year for that kind of money, like the LG G3, HTC One (M8) or Samsung Galaxy S5 - all still pretty relevant, despite their age. Other alternatives include the Asus Zenfone 2, as well as quite a wide selection of Sony devices in all sizes, depending on your preference, like the Xperia Z3 Compact, M4 Aqua or C5. Of course, we made sure to include the other Huawei devices, we have been talking so much about in the benchmark scores, just to see how the G8 sizes up in terms of performance against its bigger sibling- the Mate S, as well as the Mate7 and Honor 7, both of which also happen to bear a similar price tag. While, the Snapdragon 615 undoubtedly has plenty of power to run the G8 smoothly and the aforementioned observations about the Kirin line of chips is still true, it is only fair to point out that amidst all the aforementioned Huawei devices with their Kirin 923 or 935 chipsets, the Snapdragon 615 is actually least powerful both in terms of CPU and GPU. All of them use standard ARM cores, like the Cortex-A53, but while the Kirin 935 has four units clocked at 2.2 GHz and another four at 1.5 GHz, inside the Snapdragon 615, the more powerful four work at a frequency of 1.5 GHz and are complemented by another cluster at only 1.2 GHz. Mostly the same analysis can be made in the GPU department. The Mali-T628, a HiSilicon favorite, is hardly known for its outstanding performance, but it is still more capable than the Adreno 405 inside the G8. This all said, the Huawei G8 is, by design, less powerful than its sibling, at least on paper that is. Still, the devil lies in the details or in this case, rather, the optimization - something Huawei has been struggling with for some time now. This is where working with popular hardware, such as the Qualcomm chipset, can really make a difference when you take into account all the preexisting OS optimization that you can benefit from. The G8 finds itself in precisely this peculiar position where it often tends to outperform its siblings, despite the lower-end hardware. Let's dive into the benchmarks to explore this further. First up, we have the raw CPU performance test with GeekBench 3, which should be straight-forward enough. The eight-core Cortex-A53 setup of the Mate S definitely holds its own, but is still understandably blown away by devices equipped with better cores or higher clock speeds. Still, we can't just put the blame on hardware alone. Equally specked devices like the Samsung Galaxy A7 and the Oppo R7 are a testament to how important software optimization and proper resource utilization actually are. One could make the case that the Oppo has 4GB of RAM, but that logic quickly fails with the A7, which packs only 2GB and still managed to pull in a few points more in pure CPU performance. AnTuTu is a compound benchmark, which also takes into account RAM and GPU performance. Here we see pretty much the same arrangement, with the G8, sadly lingering near the bottom of the chart. Poor graphics performance surely took its toll in the test as well, but it is encouraging to see that the Oppo R7s and Samsung Galaxy A7 also scored around the same and the latter even less than the Huawei G8. Still, the handset doesn't come near the performance of the Mate S and even the Mate7 for that matter, which, we remind you is now a year old and happens to cost just as much. Moving on to Basemark OS II, which is a truly all-round benchmark. 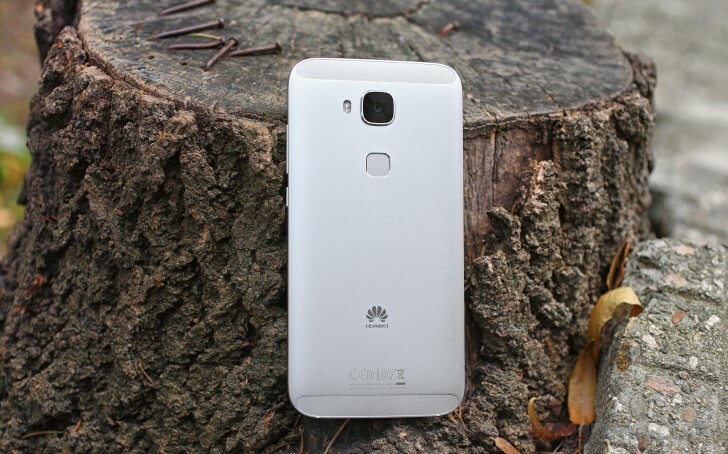 Things definitely don't look good for the Huawei G8. At the current state of the software, the G8 is a real underachiever and came out near the bottom of the overall chart. It is a slightly redeeming fact that both the Samsung Galaxy A7 and Moto X Play are close by on the same scoreboard, but there is little excuse of the extremely underwhelming single and multicore performance. From the looks of it, the new Android 5.1.1 EMUI 3.1 has some compatibility issues with Basemark OS II (or perhaps it is the other way around) as the app kept on freezing for a few seconds at a particular point in the test. We observed the same behavior on the Mate S, but with far less detrimental results and at this point, we are more included to point the finger at Huawei's software team. Pure graphics tests on the G8 are quite disappointing as well, but they do offer a plainly obvious prove for our accusations of lacking optimization. The Adreno 405, inside the G8 barely manages to pull five frames and a half on an Open GL ES 3.0 test. Needless to say, the 3.1 version is practically impossible, so much so that the test fails due to lack of memory, but even if it didn't, a score of 0 frames per second would be inevitable. However, looking at the chart, we can't help but notice that the Huawei Mate S, with its Mali-T628 MP4 GPU fairs even worse. The flagship offer is barely capable of achieving 10fps on Open GL ES 2.7 and the same goes for the Huawei P8 and P8 lite, one of which with a Kirin SoC and the other with a Qualcomm, so the chip is clearly not the problem. Meanwhile, the Huawei Ascend Mate7 and Honor 7 seem to do a much better job on the same GPU test. This all points to major software problems. Huawei is obviously struggling with the proper adoption of Android Lollipop and until said problems are resolved, we will sadly continue to observe inconsistent performance across the OEM's device family. Here's to hoping the eagerly-anticipated Mate 8 isn't plagued by the same issues and finally breaks the cycle for good. EMUI is definitely one of the better custom Android-based platforms out there with a lot of bells and whistles, nice aesthetics and powerful customization options. However, there are still a few things to be desired from the latest version of Huawei's OS, especially in terms of optimization. Back when the first Android Lollipop EMUI was released, we noticed quite a few instances of poor software optimization. Now, despite the move to Android 5.1.1, most of them appear to be still in place. The aforementioned Basemark issues is a prime example and so is the underwhelming performance of the built-in browser. Luckily, Huawei does preinstall Chrome on its handsets as well. It offers clear-cut performance and stability advantages over the default browser, making it the logical choice for end-users. However, our testing procedure requires us to put the default browser through the hoops and it is kind of an underachiever. Take a look for yourself and definitely steer clear. The Huawei G8 has some formidable problems when it comes to performance. While, none of the underwhelming scores have any instantly-noticeable reflection on the GUI and general usability for trivial tasks, but the experience is severely underwhelming in almost every more demanding app or game. Stability is a huge issues as well and we understand why this could be a major drawback for a lot of prospective buyers. There is no reason to sugar-coat it, the G8 is plagued by some serious performance issues. On these grounds alone, we would advise against picking up the G8, unless you intend to use is as a feature phone. And it doesn't really take too much shopping around to find a much better alternative, even from the same OEM with the Mate7 and Honor 7 shining as perfect examples.